Arctic ice: Maximum extent reaches record low. Ever year around the end of February, after a long winter, Arctic ice reaches its maximum extent. This year that happened around Feb. 25, when it encompassed 14.54 million square kilometers of ice around the North Pole. Sound like a lot? It’s not. Really, really not. This year’s maximum extent was the lowest on record. Ice extent (area covered at least 15 percent by ice) for 2015 (solid blue line) compared with 2012 (dashed) and the average from 1981–2010 (black line). The plot above shows the situation. The solid line shows the average ice extent over the year (measured from 1981–2010) and the gray area represents a statistical measure of random fluctuations; anything inside the gray is more or less indistinguishable from the average (in other words, an excursion up or down inside the gray area could just be due to random chance). The dashed line was the extent in 2012, when unusual conditions created the lowest minimum extent in recorded history. The solid blue line is 2015 so far. As you can see, it’s already reached maximum, and it’s well below average. It’s also outside the gray zone, meaning it’s statistically significant. It’s the earliest the peak has been reached as well. Both these facts point accusingly at global warming—more warmth, and shorter winters. We have to be careful here, because individual records can be misleading. The trend is what’s important. However, the trend is very, very clear: Ice extent at the North Pole is decreasing rapidly over time. Note that this record low extent is about 1 percent lower than the previous record … which was last year. The implications of losing Arctic ice are profound. First, high latitudes are more affected by warming; the temperature trends in the extreme north are twice what they are at lower latitudes. Melting ice does contribute to sea level rise, though not as much as melting glaciers on land. The bad news: Those glaciers are melting faster than ever. This has a second effect that may prove just as disastrous, too. All that fresh water dumped into the salty ocean changes the way the water circulates around the world. This circulation is one of the key ways warmth gets redistributed around the planet. Disrupting this cannot possibly be good news for us. You can read more about this at RealClimate, and climatologist Michael Mann discussed it in a recent interview. At the other pole, Antarctic land ice is melting at a fantastic rate, and the slight increase in sea ice is not even coming close to making up for it. Deniers love to point at the sea ice, but that comes and goes every year and is roughly stable; the land ice is melting away at huge rates. Claiming global warming is wrong because Antarctic sea ice is increasing is like pointing toward a healing paper cut on your finger when your femoral artery has been punctured. 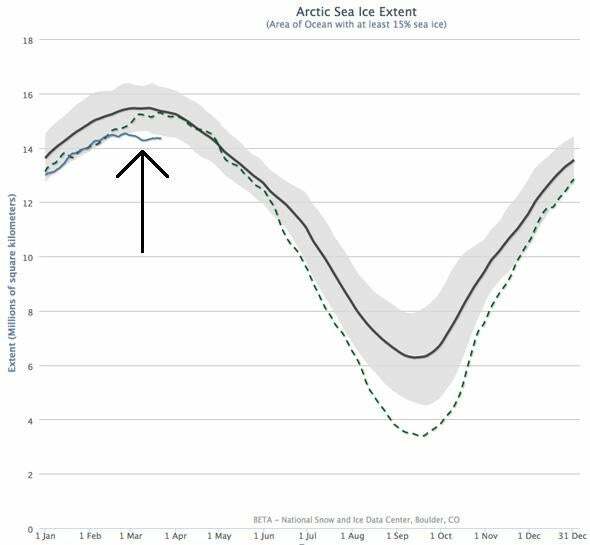 Arctic ice is like the fabled canary in a coal mine; it’s showing us very clearly what we’re in for. And what’s headed our way is a warmer planet, an even more disrupted climate, and a world of hurt if we do nothing about it.